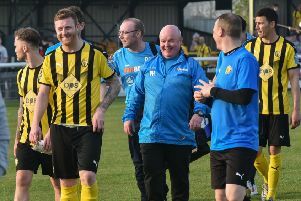 Brakes endured a miserable afternoon in Derbyshire as the home side marked Chris Moyses’ first game in charge by inflicting a heaviest defeat of the season on Paul Holleran’s side, writes Paul Edwards. Holleran restored James Mace and Kaine Felix to the starting line-up, with Ahmed Obeng dropping to the bench and Richard Taundry missing out due to injury. Kaine Felix was booked for a rash challenge from behind on Ryan Jennings inside the opening couple of minutes, the Alfreton man then kicking at thin air as he attempted to shoot following the free-kick from just inside the Leamington half. Chris Sharp had a decent shot at opening the scoring as he entered the Brakes penalty area unchallenged on the right but blazed his effort high and wide. Kieran Dunbar’s shot from the edge of the box had the sting taken out of it, while Craig Disley’s effort at the other end suffered the same fate as the two sides sized each other up in the opening 15 minutes. Jack Edwards blasted a first-time effort over the bar from Daniel Udoh’s right-wing cross and Dunbar lost his footing as he attempted an exchange of passes with Callum Gittings after a neat move in from the right. Reds keeper Chris Elliott was nearly left red-faced as he pushed Dunbar’s left-wing corner into the air and then against the post before finally claiming the ball. Leamington committed defensive suicide in giving away the opening goal in the 34th minute. It was a catalogue of errors as Connor Gudger’s first touch let him down, forcing him to play the ball wide for Breeden to try and clear. He was dispossessed on the edge of the box by Ryan Jennings and as the two hit the turf the Brakes skipper was adjudged to have fouled the Alfreton man. Brendon Daniels stepped up and sent Breeden the wrong way from the penalty spot to put the hosts in front. Gudger’s free-kick struck the defensive wall after Gittings was felled by Disley and Clarke headed on for Gittings to strike a first-time shot that was deflected over the bar. The same player then fizzed a low ball across the six-yard box which Jamie Hood missed by a whisker. Breeden’s misery was compounded when he sent a free-kick from outside the box straight to Cieron Keane on the half-way line, the former Worcester City man taking a touch and then lofting the ball into the empty net. A positive start to the second half saw Felix cut in from the left and drive in a curling strike that Lee Beevers diverted over the bar. Jennings virtually sealed the game for Alfreton three minutes into the second half, Keane laying it off for him to strike a low drive through Breeden and into the net. It became embarrassing just short of the hour-mark, Keane racing in on goal from half-way having been gifted possession and driving a shot into the corner. Udoh somehow failed to smuggle the ball home from almost on the line, while James Mace grazed the roof of the net with a good strike from 25 yards as Brakes looked to restore some pride. Holleran threw on Liam Canavan and Joe Magunda and Joe Clarke brought two superb saves from Elliott in a matter of seconds, the first an instinctive tip over the bar from a thunderous first-time volley and the second from a well-struck curling effort. Reds substitute Craig Westcarr latched on to a well-struck long ball from inside the Alfreton half and looked to drawn a save from Breeden, only for referee Sam Mulhall to award a goal kick. There was a crumb of consolation for Leamington with four minutes to play when Clarke’s attempt to drive the ball across goal from the left was adjudged to have been handled by the grounded Luke Shiels, Canavan stepping up to send Elliott the wrong way from the spot.